Commissioner Frank Carbone Tuesday surprised fellow board member Lorinda Wichman with his motion to reimpose a moratorium on impact fees through the end of 2014, following a flurry of last minute building permit applications by developers trying to meet a six-month grace period. 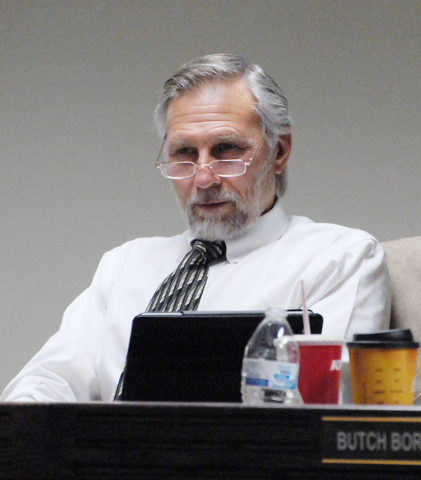 Commissioner Butch Borasky questioned whether the agenda item was worded correctly. It said discussion and deliberation but not action. The board acted in the absence of District Attorney Brian Kunzi. Commissioners had a moratorium on impact fees for two years in an attempt to draw business during the recession which they voted to let expire at the end of 2013, but people who applied for the building permit before Dec. 31 and received the permit within six months were exempt. Eight developers avoided the re-imposition of impact fees by applying for building permits before Dec. 31: the Armscor ammunition company expansion, the new Holiday Inn Express motel, the new Dollar General store, a new China Wok restaurant, a Big Five Sporting Goods store, Valley Electric Association’s new campus, a 160-room assisted living facility and a 50,000-square-foot facility that was kept anonymous. Commissioners in January voted to allow developers to make impact fee payments up until the certificate of occupancy was issued instead of when the building permit is issued. A $1,961 impact fee is paid to the county to construct single-family, detached homes. The commercial impact fee ranges from 10 cents per square foot for projects 25,000 square feet or less, down to six cents per square foot for buildings over 400,000 square feet. The school district still charges a $1,600 residential construction tax. Forty-four building permits were issued in December according to reports by the Pahrump Building and Safety Department, 30 in January, 22 in February and 33 in March. There were only two building permits for single-family homes in December, five in January and none in February but 10 single-family building permits were issued in March, with six of those being new homes going up in Mountain Falls. Carbone said there were issues with whether some of the applications in the approval process qualified for exemptions from impact fees. “We gave people a six-month grace period and got more applications turned in than we ever had suspected. We also had an issue with the county dealing with those applications,” he said. Carbone said his motion to extend the moratorium another year was made to avoid finger pointing at the county because people couldn’t get their building permit within six months to qualify for the impact fee exemption. Carbone also wanted clarification if county commissioners reimpose impact fees what they would be used for. Commissioners Dan Schinhofen and Wichman voted against the motion. Schinhofen said impact fees made it possible to do the Homestead Road-Highway 160 intersection improvements, plans for reconstructing Manse Road and a multitude of other projects. The sheriff’s department used impact fee money from their $137 per residence for a $401,000 Simunitions training center at the multi-purpose training facility on East Mesquite Avenue. But Wichman supports the idea of impact fees. She said the county has a limited tax base, impact fees allow developers in a certain area to pay for improvements just in their area without burdening countywide taxpayers. “You don’t want to pay for something in Smoky Valley. Impact fees take care of the cost of something so the entire tax base does not have to pay for that,” she said. Wichman is from Big Smoky Valley, the rest of the county commissioners are from Pahrump. Commissioner Donna Cox said she was opposed to impact fees. She said developers began coming to Pahrump in the 1980s and 1990s after Clark County imposed impact fees. But when the moratorium was lifted last November, Nye County Interim Community Development Director Darrell Lacy told commissioners the impact fees didn’t play a role in preventing developers from coming to Pahrump during the two-year moratorium period. Impact fees brought in $1.7 million during the 2006-2007 fiscal year, their first full year of implementation during the housing boom, but dropped to $99,808 by the 2010-11 fiscal year, the last full year before the moratorium.